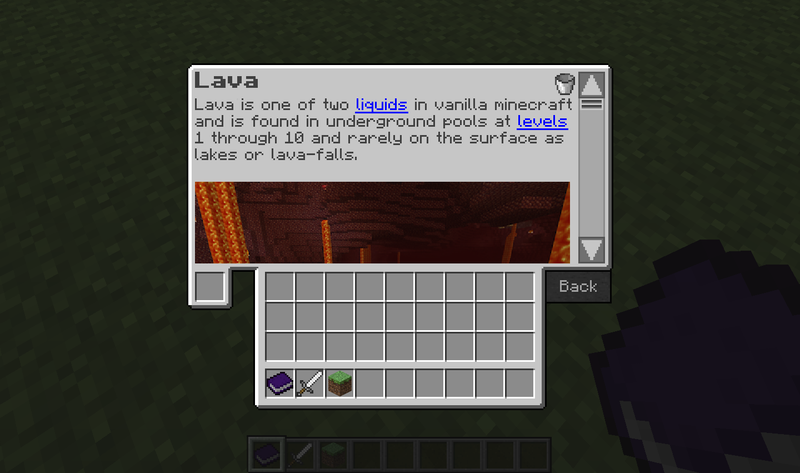 This mod adds one item, the Book of Revealing, which allows the player to derp around right-clicking random stuff to learn more about what it is, how it works, and how to use it. I've been thinking about making this mod for a while now, and I finally have—kind of—done it. There are still loads of features to add, and guides to write, and work to do. But I thought I would share what I have so far and what I'm planning on adding. So here goes. The player spawns the first time into the world with a Book of Revealing. But if they lose it they can craft another one by combining a book and a spider eye. This book is very special. When right-clicked, it opens an interface for viewing guides. If the player right-clicked on a block, it shows the guide for that block. 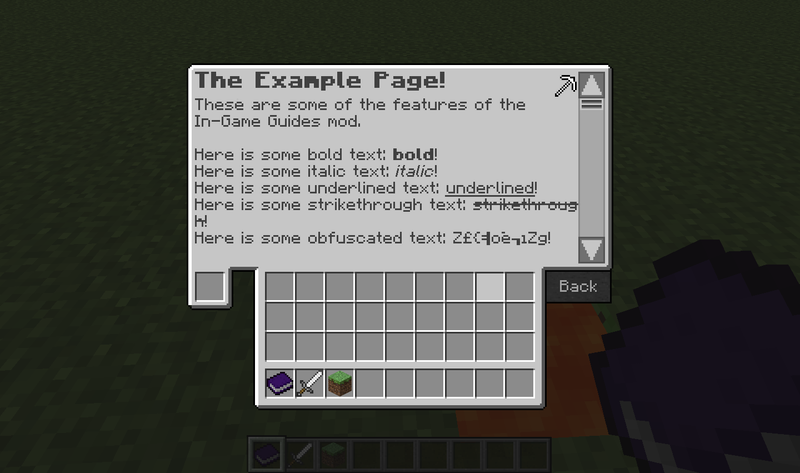 The interface also has a slot for putting items into the book and viewing their guides. Be sure to back up your worlds, I can't guarantee the stability of this mod. Let me know what you think of this mod, and any way you think I could improve it. I use some modified CodeChickenCore code and the BuildCraft core phantom slot code. Feel free to use this in your mod pack. The mod is under development, but is stable. A website is in development to crowd source the guide creation process. Optional automatic Guide pack download/update server—automatically downloads/updates the Guide pack for any mod you have installed, given there is a guide pack for it. * Given some modding experience. † Obfuscated text is that randomized text that looks like it didn't need any more caffeine. I don't know why I didn't do that in the first place.